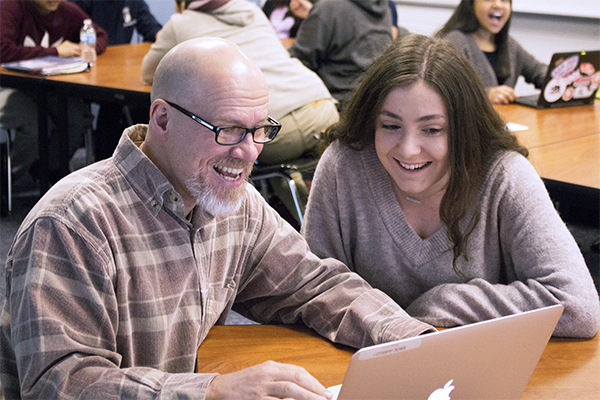 HICKS LENDS A HAND: Opening up his laptop, Daniel Hicks, social studies teacher, pulls up a presentation for junior Eva Papajohn about the singers Little Richard and Chuck Berry as a supplement for his lesson about 1950s pop culture. Hicks’s journey to become a teacher has been unorthodox, but he views his story as a source of hope for others. Whether it be living in foster care, the military or in a rural Southern town, the life of Daniel Hicks, social studies teacher, features many experiences foreign to most students at GBS. His life began in rural Tennessee and now, after many ups and downs, Hicks is here, almost five hundred miles away from where he started, happy with how things have turned out. Hicks considers foster care to have been beneficial to him, in part because of the role models he met, but also because of the lessons he learned along the way. “[In the foster homes], one of the things that struck me was the power of love and the power of caring for another individual that might not be of your own making,” Hicks said. Hicks says he originally wanted to become a lawyer to help children that faced the same challenges that he did growing up. Ultimately, he became a teacher so he could still work with kids who struggled with hardships in their life. “I always thought that maybe I would be a juvenile lawyer and give back in a way that I had seen lawyers work in my life to help kids that were misguided at times,” Hicks said. According to Hicks, his college professor was the one who suggested that he should become a teacher to fulfill his goal of helping children. To pay for his studies, Hicks enlisted in the military. He didn’t particularly enjoy all the time he spent in the army, but he says he values the lessons he learned. According to Hicks, religion was also a big part of his early life. He was introduced to Christianity at an early age, mainly through his grandmother, who was devoutly religious. However, Hicks’s tumultuous early years of his life caused him to begin to question religion as a whole and stop practicing Christianity. According to Hicks, he went through phases of being atheist and agnostic until Hicks’s wife introduced him to Judaism and he began to embrace the religion. Senior Zoe Gunderson, a student of Hicks’s, believes that Hicks is very different from other teachers at GBS. Hicks uses his own story as a source of hope for others and as proof that no matter how bad things get, they can always get better. In times of hardship, Hicks looks to a poem, “Don’t Quit” by John Greenleaf Whittier, to remind himself not to give up.